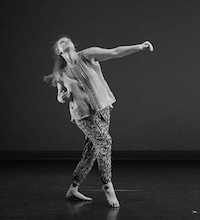 Phoebe Ballard is a mover, maker, teacher, and writer returning to the east coast after an incredibly enriching stint living in Urbana, Illinois while earning her BFA in Dance from the University of Illinois at Urbana-Champaign. A time filled with big moves and lots of laughs, she has had the privilege of performing in the works of Charli Brissey, Elise Frost, Sara Hook, Linda Lehovec, Jennifer Monson, Kendra Portier, Renee Wadleigh, and Abby Zbikowski. She has been nourished by continuing collaborations with her colleagues, and has been empowered by the joy and gusto of the students she has had the opportunity to teach. Her choreographic practices have been founded in her love of improvisation and cemented in her proclivity for writing, a practice she believes has a physicality all its own. Through language, she seeks to develop a new way of seeing and making dance: filling notebooks and blog pages with streams of consciousness writing, then editing, editing, editing. Her process with movement is much the same: consciously and consistently prioritizing dance as a way of being together, as a way of becoming more fully human.